The blessed month of Ramadan is the busiest month of the year for Muslims, with all of us trying to juggle fasting and night prayers with our family and work commitments. This is where Zabiha Halal comes in with their new line of frozen products. When you are in a time crunch in Ramadan, what better to save time than to prepare and serve your family a delicious meal from Zabiha Halal’s range of products. We believe that Ramadan is not the time to spend in the kitchen, as we should be using our time wisely to increase our acts of worship. The best part about all of this is that Zabiha Halal has partnered up with Islamic Relief Canada for the ‘Do Good, Eat Good, Feel, Good’ campaign and proceeds for selected products go towards helping the needy. We had the opportunity to try out Zabiha Halal products for our Iftaar Party, which included the Puff Pastry Hors D’oeuvre’s Collection, Chicken Fries, Homestyle Hawaiian Pizza, Homestyle Pepperoni Pizza, and the Chicken Lasagna. We were pleased with how easy it was to prepare all of these products; just stick them in the oven, put the timer, and they were ready! The Chicken Fries were the perfect finger food and were a hit with all the kids at our party. We saw our two year old nephew with chicken fries in both hands and he was happily munching away on them. The crunch on the Chicken Fingers also made them a popular iftaar item with the adults. We served ours with ketchup and chipotle mayo and these made for ideal dipping sauces. The Puff Pastry Hors D’oeuvres Collection was our personal favourite. Each box consisted of 40 pieces in total, with individually wrapped packages inside with the four different flavours. The Fresh style puff pastry comes in four varieties: Buffalo Chicken (our favourite), Chicken Sausage, Cheese & Spinach, and Sweet Potato & Goat Cheese. These appetizers were ready in 15 minutes and were devoured by our guests in minutes! They were so light and flaky, and were the perfect size for appetizers. We highly recommend these. For the entrees, we served Chicken Lasagna and the Homestyle Pizzas. We absolutely loved the Chicken Lasagna. It had the perfect ratio of sauce, to minced chicken meat, to cheese, to noodles, and it was perfectly seasoned. The lasagna came out very easily from the container to serve: just flip it over from the container onto a plate and it came out clean. The Homestyle Hawaiian Pizza had smoked chicken strips and pineapple, and it was a combination that our guests found different, yet exciting. The Homestyle Pepperoni Pizza was a classic, and a kid favourite. Both pizzas had a generous amount of cheese and toppings, and were crowd pleasers. Overall, we found that Zabiha Halal’s frozen products were not only incredibly easy to prepare, but they were delicious and filling. The portion sizes were generous and justified the price. We salute Zabiha Halal for taking part in the ‘Do Good, Eat Good, Feel Good’ campaign, as consumers can feel good about their purchases as the donation will add to their good deeds. Categories: Product Reviews | Tags: Halal Food, Halal Food Blog, Halal Food Bloggers, Halal Food Enthusiasts, Halal Food Review, Halal Foodies, Halal Frozen Dinner, Halal Frozen Food, Zabiha Halal, Zabiha Halal Chicken Fingers, Zabiha Halal Frozen Products, Zabiha Halal Homestyle Pizza, Zabiha Halal Hors D'ouevres, Zabiha Halal Lasagna | Permalink. Haze Lounge seems to be a popular place to chill in the Mississauga area. We heard good things about their food for awhile now, so we decided to check it out for lunch recently. What held us back from visiting this restaurant was the fact that it is primarily a shisha lounge, and hence, we were a bit uncomfortable of how the ambiance would be. The restaurant has a nice patio, which we would have preferred but the day we visited was a bit chilly. Inside the restaurant, it was a bit dark. While we did like the antique lamps and the the lattice separating the booths, the ambiance really wasn’t for us (even in the afternoon time) and the smell of shisha was everywhere (second hand smoke alert). However, we were there for the food, so we proceeded with ordering our meal. We started with BBQ chicken wings ($11.50). The chicken wings were exceptional and had the perfect crunch to sauce ratio. For the entrees, we ordered the Philly Cheese Steak ($11), Portobello Chicken ($16.50), and the Half Rack of Lamb ($19). The Philly Cheese Steak lacked the wow factor. We wished it had more cheese and more seasoning. There was a generous amount of steak, which we did like. The Portobello Chicken was our favourite. It was a juicy piece of chicken on a bed of buttery mashed potatoes, topped with roasted mushrooms and asparagus with a generous serving of sauce. We were in love with this dish and highly recommend it. Next up was the Half Rack of Lamb with mashed potatoes and vegetables. There were four lamb chops around a bed of mashed potatoes, and drizzled with gravy. While we enjoyed the mashed potatoes and the gravy, the overall dish did not impress us. We were given complimentary dessert (two plates of them) because one of our entrees came a bit late. We appreciated this gesture by the staff. We were presented with Sticky Toffee Date Cake with Ice Cream. My oh my, this cake was a piece of heaven. The date cake was warm and the toffee sauce on top was incredible, and paired with vanilla ice cream, this dessert suddenly turned our lunch into a pleasant experience. All the food at Haze Lounge is made from scratch, and there are definitely delicious options on their menu. While we would want to go back for the food, the ambiance of the restaurant is not really for us. Perhaps, opting for the patio in the summer would be a good option for us. Please note: Haze Lounge is open to Families every day until 6pm. They have a strict 19+ policy after 6pm. Categories: Restaurant Reviews | Tags: Date Cake, Halal Chicken Wings, Halal Food, Halal Food Blog, Halal Food Bloggers, Halal Food Enthusiasts, Halal Food Review, Halal food toronto, Halal Rack of Lamb, Halal Restaurant, Haze Lounge, Haze Lounge Mississauga, Haze Lounge Review, Mississauga | Permalink. You may remember our 2013 post on Zem One. Since our last review, the restaurant has moved to a new location with new management (but the same owner). It is the same great halal Japanese food, but with a new sushi chef on board and everyone we know has been raving about his sushi. We were in for a pleasant surprise. Located at 51 Village Centre Place in Mississauga, Zem One is a hidden gem in the Square One area but away from the hustle and bustle. We loved the quaint nature of the location, which had a nice brick patio and water feature. The inside of the restaurant had a serene ambiance, which we quite enjoyed. We liked how it was not as crowded and loud as some of the other sushi restaurants. The simple and well maintained decor contributed to the ambiance. It a perfect place for dinner with your special someone. Since Zem One is located in an area surrounded by executive buildings, it is quite busy during breakfast and lunch hours. We visited the restaurant for an early dinner and went for the All You Can Eat menu. If you have read our 2013 post, you may remember that we were not huge fans of sushi back then. However, all that has changed in recent years, and we can be found munching on Dynamite Rolls. We started with Chicken Corn Soup, Hot and Sour Soup, and Tom Yum Soup. The Chicken Corn Soup is our all time favourite, and always lifts our mood. The Hot and Sour Soup had a a generous serving of chicken in it, and we loved the spicy kick it had. The Tom Yum Soup was hot and tangy, just the way we like it. The soup servings for the AYCE menu were generous, and quite filling. Next up for appetizers were Shrimp and Sweet Potato Tempura along with Edamame. We love anything deep fried, so tempura is always in our good books. The crunchy panko coated seafood and vegetable tempura, dipped in sweet sauce is a match made in heaven. Pad Thai is by far our favourite carbohydrate-laden food. Stir fried rice noodles with shrimp and flavoured with tamarind and fish sauce, this Pad Thai did justice to our taste buds. We would order this again in a heartbeat. We also tried the Szechuan Shrimp, which had a rich sauce and generous amount of vegetables and shrimp. The chili paste and the use of Sichuan peppers made this dish spicy. Next up was the star of the night, sushi! We started with California Roll, Red Tuna Sushi, Salmon Sushi, Shrimp Sushi and Sashimi pieces. We found the seafood to be fresh and flavourful, and the sushi was devoured within minutes. Our absolute favourite is the Spicy Dynamite Roll, which has shrimp tempura, cucumber, crab and avocado, topped with spicy mayo. The combination of the spicy sauce with the crunchy shrimp and cool cucumber is what elevates the Dynamite Roll. We highly recommend this dish. The Torched Mississauga Paradise was the best sushi we had that night. It had spicy salmon, avocado, cucumber, crab, cream cheese topped with spicy mayo and teriyaki sauce. The use of the blow torch allowed the spicy mayo and teriyaki sauce to melt right into the sushi, and created a heavenly roll. Check out the video we made of how this roll was made. And because we can never get enough of sushi, we ordered sushi to-go. Pictured below is the Rainbow Roll, which had cucumber, avocado and crab, topped with tuna, salmon, butterfish and shrimp. We enjoyed this thoroughly for lunch the next day. We also ordered the Crunch Roll, which had cucumber, avocado, crab, shrimp tempura and topped with tempura flakes. This, again, was munched away the next day. Given our sweet tooth, we couldn’t leave without dessert (although we were already in food coma). We ordered Coconut and Mango Ice Cream. These were the classics we love and provided a sweet ending. The Tempura Cheesecake was hands down the best dessert ever! 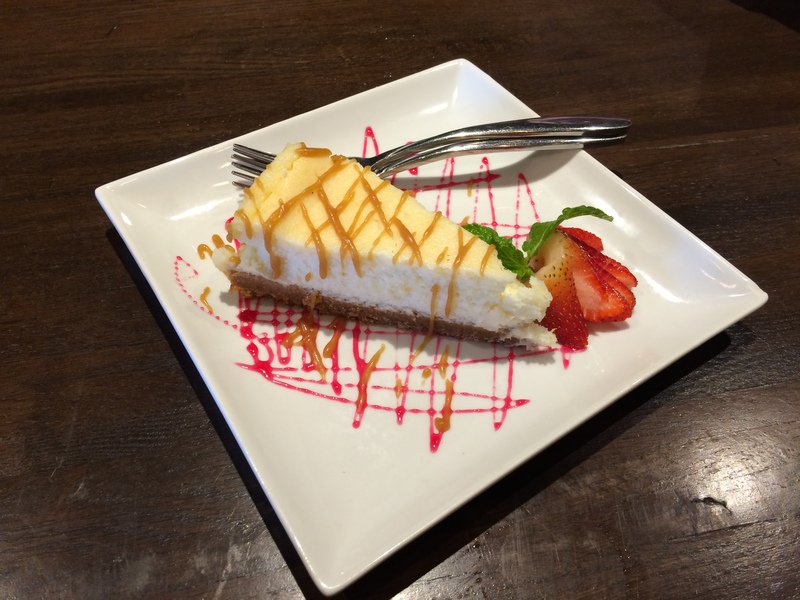 We are HUGE cheesecake fans, so imagine our delight when we had this deep fried cheesecake. It was everything our sweet tooth could have asked for and more. It was creamy cheesecake, dipped in batter and coated with tempura, and fried to perfection . We can’t even begin to describe the epic-ness of this cheesecake. A definite must try if you visit Zem One. Zem One is one of the few Japanese restaurants in the GTA offering halal food, so kudos to them for this. The friendly service, freshly prepared food, and the cozy atmosphere allowed us to wholly enjoy our dinner at Zem One. Do we recommend this restaurant? Yes (and please take us with you)! Categories: Restaurant Reviews | Tags: AYCE Sushi, dessert, dinner, GTA, Halal Chicken, Halal Dessert, Halal Food, Halal Food Bloggers, Halal Food Enthusiasts, Halal Food Mississauga, Halal Food Review, Halal food toronto, Halal Japanese Food, Halal Japanese Restaurant, Halal Restaurant, Mississauga, Spicy Dynamite Roll, Tempura Cheesecake, Torched Mississauga Paradise, Toronto, zem one | Permalink. 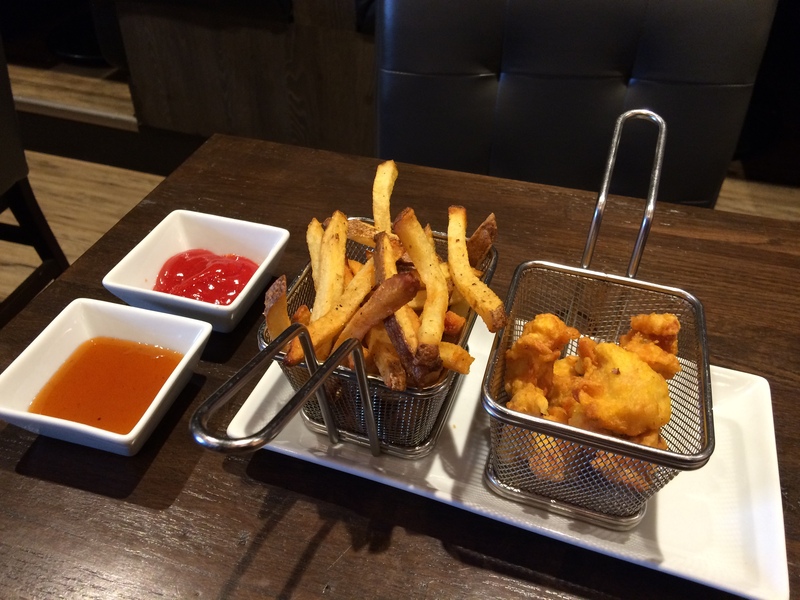 Check out our review of a chicken and waffles joint in downtown Toronto. Categories: Restaurant Reviews, Uncategorized | Tags: Chicken and Waffles, Cluck Clucks, Halal Chicken and Waffles, Halal Food, Halal Food Bloggers, Halal Food Enthusiasts, Halal Food GTA, Halal Food Review, Halal food toronto, Toronto | Permalink. Our little one enjoys watching Dora and Friends. In one episode, they were making a coconut cake and ever since then we had a major craving for it. So Pinterest came to the rescue. We found a super duper easy recipe for coconut poke cake. The recipe is from mybakingaddiction‘s website. We loved how it used simple ingredients. 1. Prepare and bake white cake mix according to package directions for a 9×13 inch cake. 2. In a medium bowl, whisk together the cream of coconut and sweetened condensed milk. 3. Remove cake from oven and place on a cooling rack. While still hot, use a skewer to poke holes all over the top of the cake. 3. Spoon the cream of coconut and sweetened condensed milk mixture over the cake while the cake is still hot. 4. Let cake cool completely. Top with whipped topping and shredded coconut. 5. Cover and refrigerate overnight before serving. Ok, so we know the pictures look unimpressive but we didn’t really think it would turn out all that great. But we were wrong. We LOVED it. It was so light and refreshing. Categories: Recipes | Tags: Coconut, Coconut Cake, Coconut Poke Cake, dessert, Easy Dessert, Halal, Halal Food, Halal Food Blog, Halal Food Bloggers, Halal Food Enthusiasts, Simple Recipe | Permalink. We were asked to try out EarthFresh’s Organic Potatoes in a recipe, so we went to our favourite potato recipe that we always make for parties. EarthFresh’s Organic Red Baby Potatoes came in a light blocking bag to protect the potatoes from greening. Grown to strict organic standards, these potatoes are grown using environmentally friendly farming methods to preserve the long-term health of our ecosystem. We washed and scrubbed the potatoes. Isn’t that brush the cutest? Once the potatoes were nice and clean, it was time to cut them up. We cut them into fours to make them bite size. Next we spread the potatoes on a foil tray. They were brushed with olive oil. We used about 2 tablespoons of extra virgin olive oil. We seasoned the potatoes with 1 tsp oregano, 1/2 tsp garlic powder, 1/2 tsp salt, 1/4 tsp red pepper and 1/4 tsp crushed red pepper. Potatoes ready to go in the oven! We baked them at 400 F for 40 minutes. We garnished it with cilantro. The potatoes had a creamy texture and the seasoning added a South Asian flare to them. EarthFresh’s potatoes can be used in a loads of recipes, from breakfast, lunch and dinner. Potatoes are a versatile ingredient and fit into a healthy diet when consumed in moderation. Categories: Recipes | Tags: EarthFresh, EarthFresh Potatoes, Easy Recipe, GTA, Halal Food Enthusiasts, Halal Food Review, Organic, Organic Potatoes, Potatoes, Roasted Potatoes Recipe | Permalink. If you know us, you know that we are die hard mithai fans. 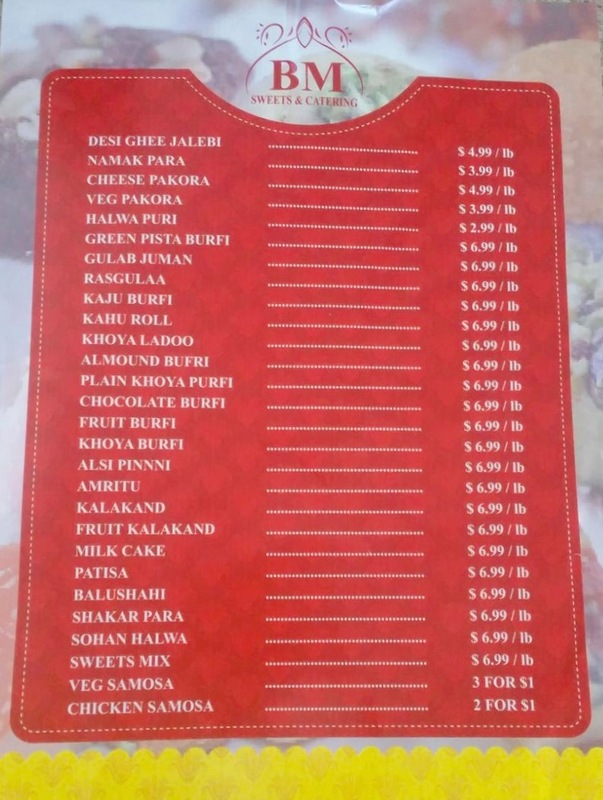 Ever since we moved to the west end of the city, we have been on the lookout for a good mithai shop. We heard of BM Sweets through a relative and they were raving about their sweets. Since BM Sweets doesn’t have a website, Facebook group or any sort of presence online, it was a bit of challenge to find. But we did find it eventually in the Heartland area of Mississauga. It’s a small takeout shop with friendly customer service. On our first visit, we got a small box of assorted mithai. The mithai at BM Sweets is pretty darn good. We particularly enjoyed the barfi and the gulab jamuns. On a subsequent visit, we tried their jalebi and also found that to be delicious. Whenever we go with our little one, they have always given us a free piece of mithai. Someone sure knows how to win our hearts. Our family enjoys their samosas a lot. 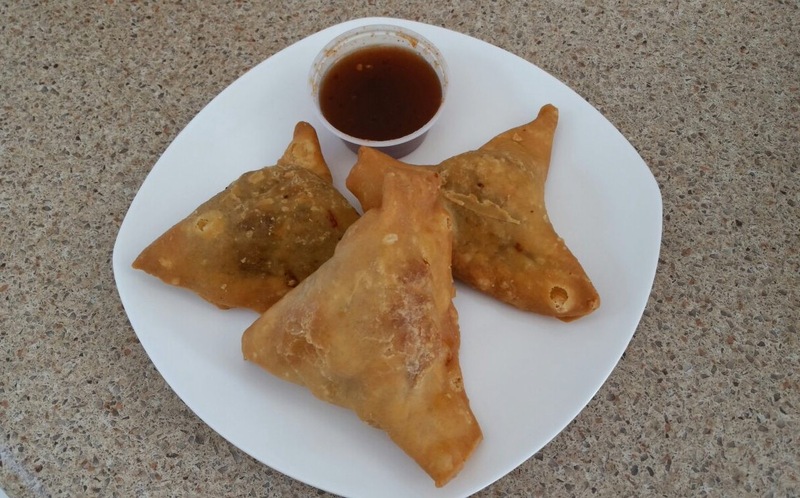 We tried the chicken and veggie samosas that came with free chutney (yes, free). Our favourite are the chicken samosas. Being South Asians, we have a never ending love affair with samosas and chutney. 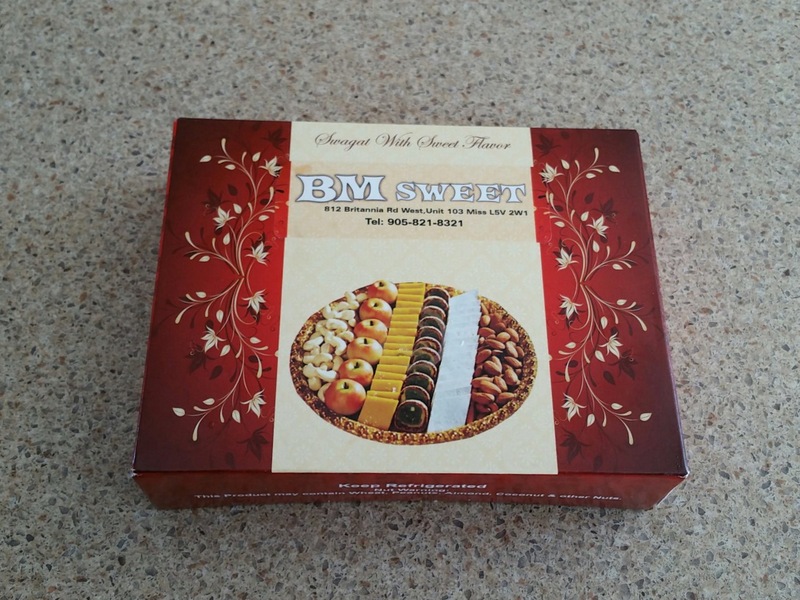 So the next time you’re in the mood for mithai or need to take mithai to that someone special’s house or you’re obliged to be fed mithai for your special occasion, we recommend giving BM Sweets a try. Categories: Restaurant Reviews | Tags: barfi, Gulab Jamun, Halal, Halal Food, Halal Food Blog, Halal Food Bloggers, Halal Food Enthusiasts, Halal Food Mississauga, Halal Food Review, Halal Samosa, heartland mississauga, Heartland Town Centre, Jalebi, Mithai, Mithai Shop, Mithai Shop Mississauga, Pakistani Mithai, Pakistani Sweets, Samosa Mississauga, South Asian Sweets | Permalink. Check out our review of the newly opened Moods Eatery and Cafe on Halal Foodie. Categories: Restaurant Reviews | Tags: Halal, Halal Burger, Halal Food, Halal Food Blog, Halal Food Bloggers, Halal Food Enthusiasts, Halal Food Oakville, Halal Food Review, Halal North American Cuisine, Halal Steak, Moods Eatery and Cafe, Oakville, Oakville Halal Cafe, Oakville Halal Eatery | Permalink. 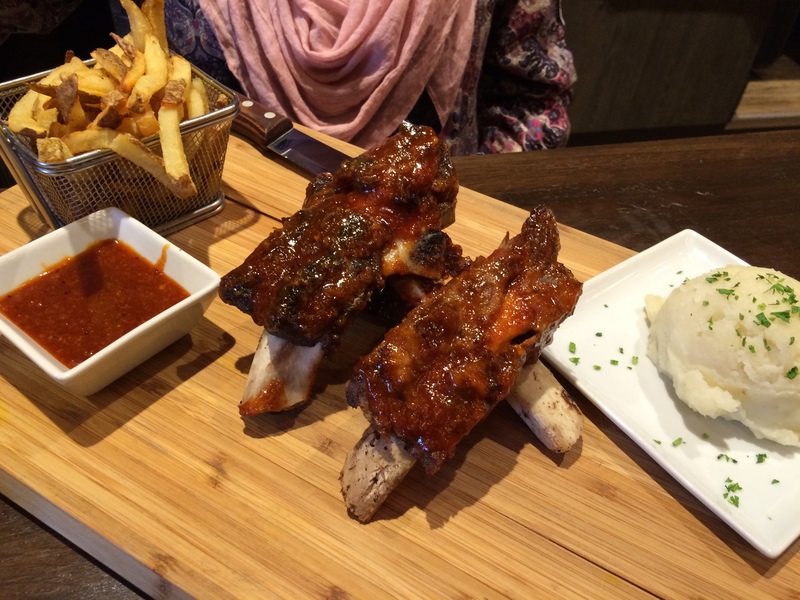 We made the much awaited trip to Scarborough recently to finally try Black Ox Bistro. We went around lunch time and found the restaurant to surprisingly quiet. We were greeted by a very enthusiastic (yet professional) server who escorted us to table. He raved about the ribs, the stuffed chicken and the chicken fettuccine. By the way he described the dishes we were super excited. He definitely knew how do his job well. For our little one, we ordered the Chicken Nuggets ($7) with fries that came with ketchup and plum sauce. These weren’t your run-of-the-mill breaded nuggets. These were batter dipped and fried. We thought the nuggets could have used a bit of extra seasoning. They did taste good with the plum sauce, however. The portion size was appropriate for our toddler. Our favourite thing at Black Ox Bistro was definitely their drinks. 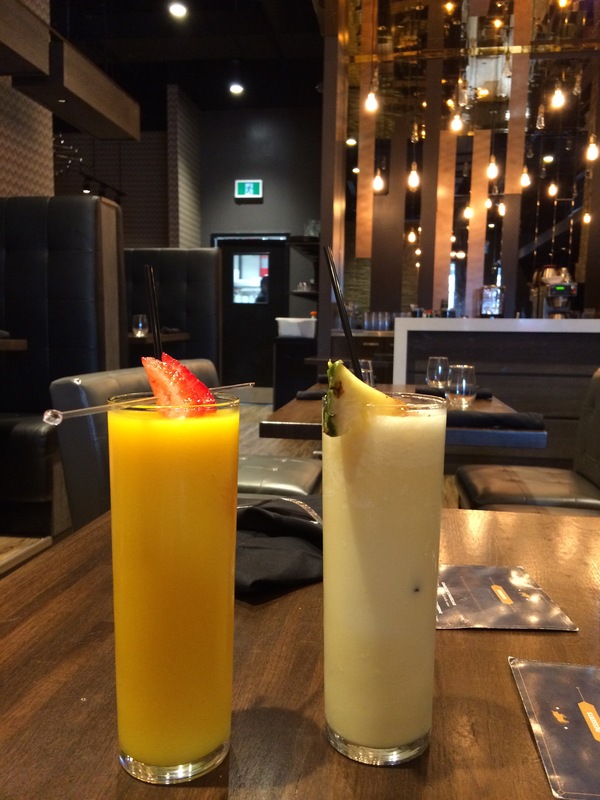 We tried the Pina Colada and the Mango Lychee drinks. Both were bursting with flavour and were blended to perfection. We highly recommend trying items from their drinks menu. The first entrée we tried was the Roasted Vegetable Stuffed Chicken Breast ($19). The chicken was stuffed with fire-roasted vegetables, goat cheese and thyme/rosemary sauce. It came with two sides, so we got mashed potatoes and fries. Unfortunately, this was our least favourite dish. It was definitely edible but just wasn’t for us. We did enjoy the fries though. We have heard people raving about the ribs from Black Ox Bistro for quite some time now so decided to take the plunge (we say that because we rarely order beef) and ordered the half rack Classic Beef Short Ribs ($22). The ribs were smothered with Korean Bulgogi BBQ sauce. We believe the sauce served on the side was a different kind but we don’t know the name. For sides, again we got fries and mashed potatoes. The ribs were tender and juicy and the sauce was the definitely the saviour. While we thought the ribs were good, we didn’t understand the hype around it. For dessert we ordered the Lemon Zest Cheesecake ($7) with dulche de leche sauce. Dulche de leche is one of our favourite dessert sauces so when we read that we imagined a slice of cheesecake covered with the sauce. It was actually just a drizzle. The first bite was quite lemony but the flavour grew on us after a few more bites. We have to say that the service was commendable and the professionalism was impressive (given that no other halal restaurant has professional servers). However, when it came to the food we were a bit underwhelmed. It is possible that we didn’t make very good choices for the entrées. 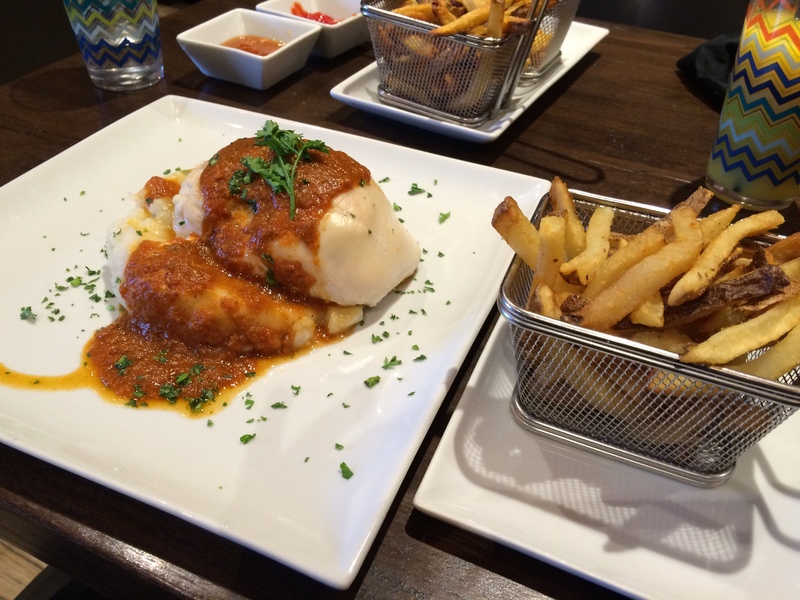 Have you visited Black Ox Bistro? What did you think of their food? Categories: Restaurant Reviews | Tags: Black Ox Bistro, Black Ox Bistro Halal, Halal, Halal Cuisine, Halal Food, Halal Food Blog, Halal Food Bloggers, Halal Food Enthusiasts, Halal Food Review, Halal food toronto, Halal Restaurant, Halal Restaurant Scarborough, Halal Restaurant Toronto, Halal Ribs | Permalink. We had an amazing time at Muslim Fest this year. Since we went on both days, we got to try food from most of the food vendors. Please excuse us for the horrible pictures; we didn’t plan on blogging about this event and so we had just taken casual pictures of the food we ate. We had the Lahmacun from Pasha’s, which was a thin bread topped with minced beef, vegetables and herbs. The giant bread was cooked fresh and wrapped with salad. It was quite filling but we thought it was dry. A bit of sauce would have been great. We took a really cool video of it being cooked for Snapchat but…it’s gone now. 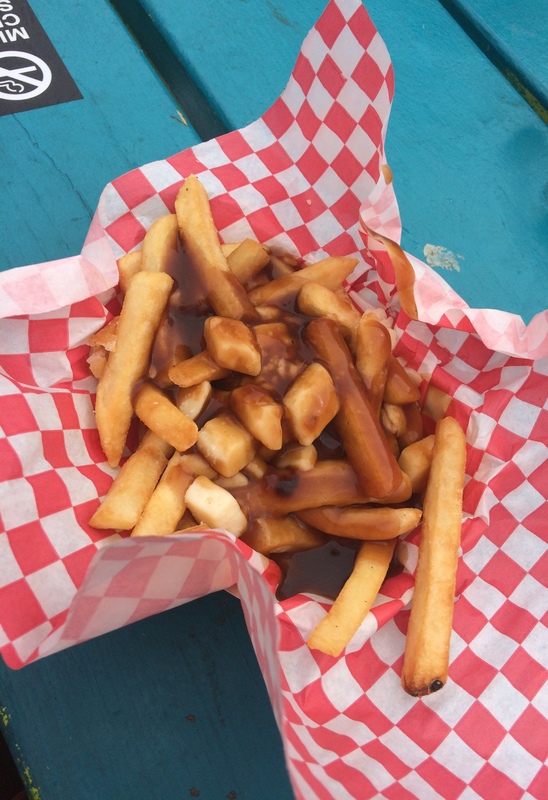 We heard a lot of the BBQ Brothers at the Halal Food Fest and had been looking forward to trying their meat lovers poutine. As we lined up, the idea of tandoori chicken, kabob and jerk chicken on poutine just didn’t sound so appetizing. We ended up just getting regular poutine, which was average. Aside from Pasha’s, there was another Turkish vendor that had interesting things on the menu. One of us got the Doner Shawarma, which was delicious. We had asked for extra sauce, but it still wasn’t enough for us. 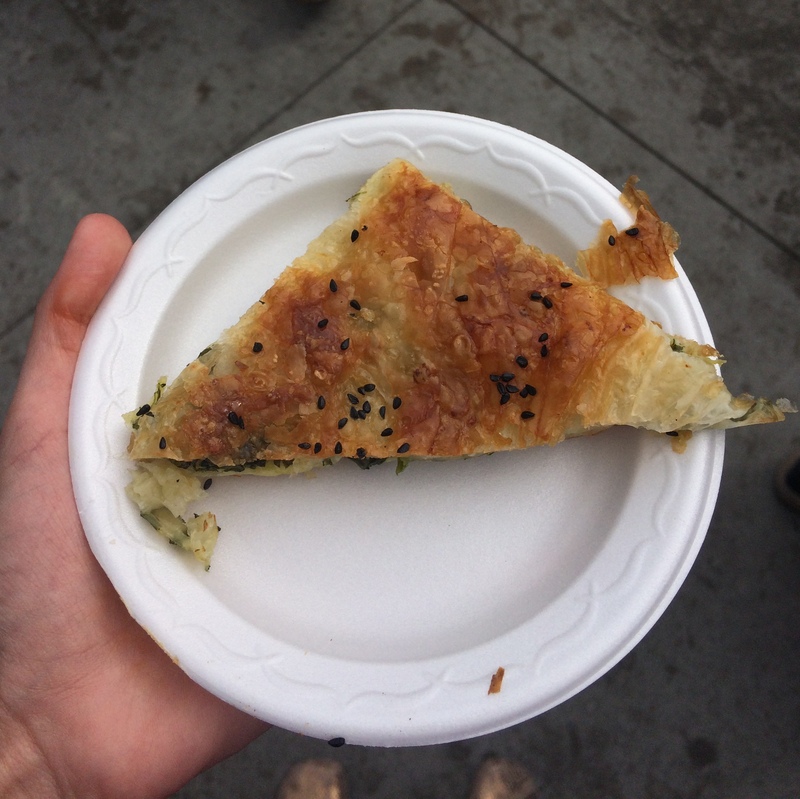 We also tried their Spinach and Feta Cheese Borek. This was light and fluffy and for $1.50 we didn’t mind trying it. We also got their Baklawa. 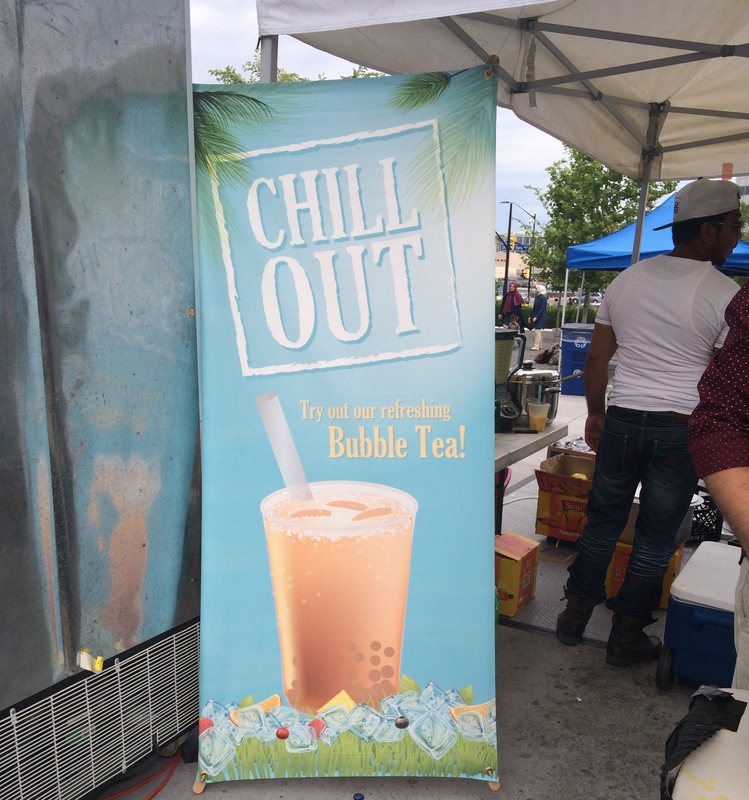 Our favourite vendor, by far, was the Chill Out booth. Their mango bubble tea with lychee jelly was the most incredible drink ever. It was so good that we went back three times. The third time, they actually gave us a discount. This drink alone was worth going to the Muslim Fest on both days. We also tried their lychee bubble tea, which was also good, but couldn’t beat the mango one. East Meats West sandwiches are our weakness. We got the Pastrami sandwich and it was worth every single ounce of saturated fat and every milligram of sodium. Yumm! Our mom tried the falooda flavour Kulfi and we also tried fries from the Popeyes booth. Both items were priced well but not really worth the calories in our opinion. Overall, the beautiful weather, the great food and atmosphere really made Muslim Fest 2015 a great event. 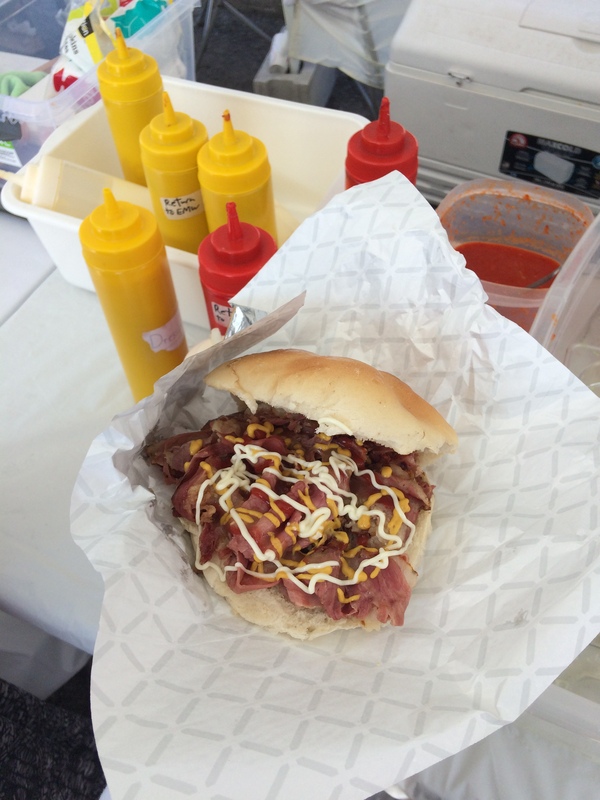 Categories: Product Reviews | Tags: BBQ Brothers, Celebration Square, Chill Out Bubble Tea, East Meats West, Halal Fast Food, Halal Food, Halal Food Blog, Halal Food Bloggers, Halal Food Enthusiasts, Halal Food Mississauga, Halal Food Review, Halal Pastrami Sandwich, Halal Poutine, Halal Turkish Food, Mississauga Celebration Square, Muslim Fest, Muslim Fest 2015, Muslim Fest Mississauga, Turkish Food | Permalink.